Here begins the Battle Road. 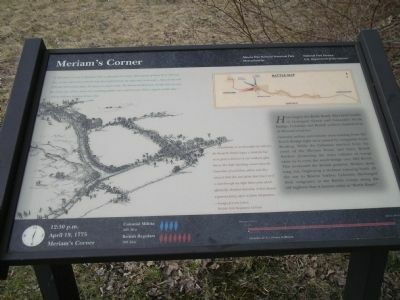 After brief battles at Lexington Green and Concord’s North Bridge, Colonists and British soldiers clashed here at Meriam’s Corner. 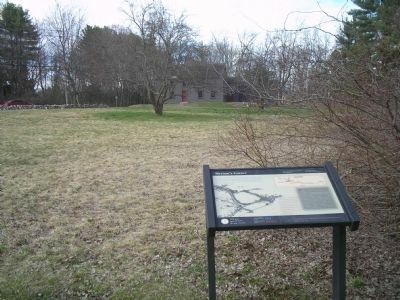 The 1663 house of Josiah Meriam can be seen behind the marker. 16 miles & 6 ½ hours to Boston. Erected by Minute Man National Historical Park. Location. 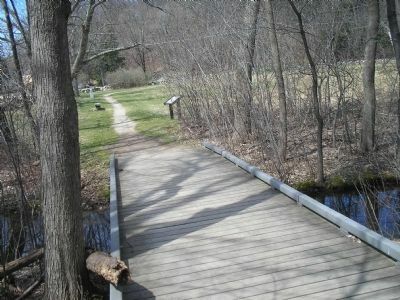 42° 27.562′ N, 71° 19.434′ W. Marker is in Concord, Massachusetts, in Middlesex County. Marker is at the intersection of Lexington Road and Old Bedford Road, on the right when traveling west on Lexington Road. Touch for map. Marker is in Minute Man National Historical Park, along Battle Road. Marker is in this post office area: Concord MA 01742, United States of America. Touch for directions. 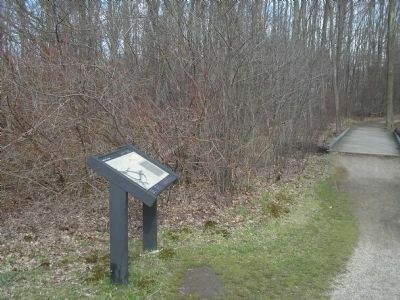 The Battle Road walking trail in Minute Man National Historical Park begins at this site. in a direct line); Bedford Minutemen (about 700 feet away); Ephraim Wales Bull (approx. 0.4 miles away); Nathaniel Hawthorne (approx. half a mile away); The Larch Path (approx. half a mile away); The First Settlement - 1635 (approx. half a mile away); Casey’s Home (approx. half a mile away). Touch for a list and map of all markers in Concord. More about this marker. The left side of the marker contains a picture of the Colonials and the British troops clashing at Meriam’s Corner. The top of the marker features a map of the route from Concord to Boston, with the site of the Meriam’s Corner clash indicated. 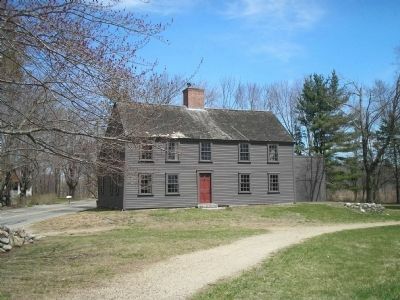 Colonists used this house for cover as they watched the approach of the British troops on April 19, 1775. More. Search the internet for Meriam’s Corner. Credits. This page was last revised on June 16, 2016. This page originally submitted on April 18, 2009, by Bill Coughlin of North Arlington, New Jersey. This page has been viewed 2,808 times since then and 39 times this year. Photos: 1, 2, 3, 4, 5. submitted on April 18, 2009, by Bill Coughlin of North Arlington, New Jersey.